Centurion Quintus Dias: [narrating] In the chaos of battle, when the ground beneath your feet is a slurry of blood, puke, piss and the entrails of friends and enemies alike, it’s easy to turn to the gods for salvation. But it’s soldiers who do the fighting, and soldiers who do the dying, and the gods never get their feet wet. – from the movie Centurion. This quote is haunting. Friends and enemies together in the unforgiving harshness of battle. No, I don’t think we’re currently living the nightmare Quintus painted. We aren’t battling alongside our friends. Many of us are hardly speaking. We’re either afraid we’ll lash out with our politics or we’ve shunned some of them already. Maybe my picture is too bleak. Correct me if I’m wrong here, but how many of you have dropped the social media life? Facebook family anyone? I feel like I’m recovering from a bad breakup. Or my feet got wet. I’m feeling icky. Is it soup time? Thanks for stopping by! Take care of yourself. Earlier I was feeling a bit morose. I was feeling a bit sorry for myself. Actually, it has been for the last several days. Janet had private a pity party. I didn’t stay in that state because I know that it doesn’t help. I prefer to find the reason for my mood and do something about it. Most of the time, my moods come and go without lingering. This time my emotions and I seemed to be playing peek-a-boo. That’s why I realized that this could be important. I stopped swiping them to the side and just looked. Yes, I missed seeing my children since they’ve grown up. I missed reading their cute little books to them and watching the cartoons they enjoyed. Their squirmy bodies would curl up next to me on the couch while we watched The Lion King or 101 Dalmatians for the thousandth time. Memories and grief are normal and usually don’t last. This time I realized it wasn’t just those instances that were absent. I needed to wake up and notice what was lacking in my life. It reminds me of food cravings. Most foods that I crave are an impulse. I read about brownies and suddenly I’m overwhelmed with a craving for brownies. The same happens with coffee or popcorn or any other food. But other times a food craving lingers and I realize I’m craving something my body needs at that moment. Using the same logic for my emotions, I must need something that I was getting during the time I was spending time with my kiddos. I’m sure that you’ve analyzed this and you are shouting at your screen how obvious it is. Sometimes I am a little slow when it comes to my emotional needs. It happens most often when I am trying to fill an idealized version of myself. Much like looking at a picture in a magazine of a living room. It’s decorated so perfectly. All of the books stacked and the table is free of clutter. Shoes are out of sight and obviously, no one has a throw pillow on the floor or a blanket nailed over a window to block the sunlight. My living space is real and as much as I want it impressively decorated and ingeniously designed, it isn’t. My house fits me with its galley kitchen and old refrigerator. The place is close to the highways I use and the cost of maintaining my place is minimal. No fuss and that’s how I like it. This body of mine is a real body. It is my living space. I have to treat it in the way that helps it work the best. If I over stress it with high expectations or overwhelm it with too many activities, it will start throwing alarm switches until I listen. This last week my body has started with reminding me that frugality is admirable but stinginess is cruel. My washing machine quit working a few weeks back so I had been “making do” until I could save enough to buy a new washer. While that sounds wonderful, I realize I was not being frugal for a purely financial reason. There was a huge chunk of ego that wanted to boast how worthy I am! Quite a laughable thing once I realize what a tricky thing our psyche is. After taking a step back and looking at the situation I went to a local home improvement store and financed a washing machine. True, I could have waited, but it was stressing me unnecessarily. 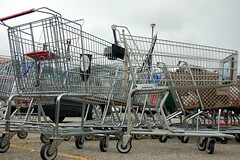 Have you ever tried to push a shopping cart with a twisted wheel? That’s how it felt. I kept going, kept trying, because that’s what I do. I keep pushing because I know I can. I’m strong and capable, right? When I took care of my needs I realized how tiring my enduring had made me. When I stopped trying to push the broken cart down the aisle I could release the burden I was carrying. What was I talking about? Pity party? So, back to my pity party. What is your estimation of my mood? Was it because I really missed my children? Or maybe I missed the moments that seemed carefree? To me there were no better moments in my life than those when I could just sit and be there with my boys. Them and their little boy TV shows filled with whimsical characters and superhero outfits. I feel better now. Revived and refreshed. Somehow just taking the time for myself to remember that part of my life, the joy of it, has brought a smile to my face. I am no longer sad that I can’t have those little guys as a part of my life anymore. They are a little big for Power Rangers. I can now come back to my present moment and I can spread a bit of the whimsy to today. I realize I had unrealistic expectations of myself and I wasn’t allowing myself to live in the moment. I choose to let joy and life flow through me, so that when the time comes I can also bring joy to others. I choose to be a part of life in the now and not above it. The future is sometimes frightening and I don’t want to face it but there is always a way. There is always a simple step. It’s not always the boastful, shiny, impressive way, but there is a solution. I choose to glean the joys of yesterday and like seeds in the garden, I will sprinkle them with honor and watch them blossom.